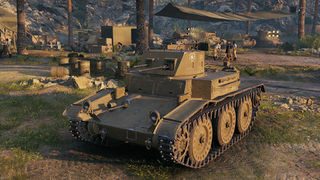 Der T7 Combat Car ist ein amerikanischer premium leichter Panzer der Stufe 2. 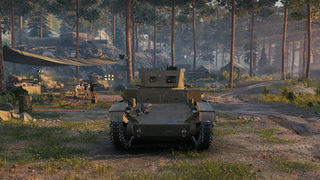 The T7 was a gift tank given to all players (who registered before patch 8.9) to commemorate World of Tanks receiving the 2013 Golden Joystick award. It was also given to players who logged in for 30 days during the 2015 Login Bonus event. The machinegun-armed T7 trades thin armor, poor penetration, and long clip load time for great speed and the ability to do massive burst damage in a short amount of time. Best when played as a support tank, the T7 is a dangerous flanker and ambusher. Predominant among the T7's strong points is its high burst damage. A single clip of ammo carries a potential damage of 400 average hitpoints - more than enough to kill two tier II tanks with one clip. With a rate of fire of roughly 454 rounds per minute when loaded, the T7 is capable of dealing this damage in just under 5.5 seconds. When firing, the T7's dispersion does not fly wildly and has a quick reload time, meaning that at close ranges, its shots are fairly accurate, enhancing the burst damage. This burst damage comes at the cost of reload time. It takes roughly 24 seconds to load a new clip, and during this time the the tank is left completely defenseless due to its lack of armor. 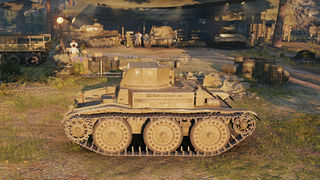 In addition, the T7's M2 machine gun has very poor penetrating ability and can only fire regular AP rounds, rendering it ineffective at long range. 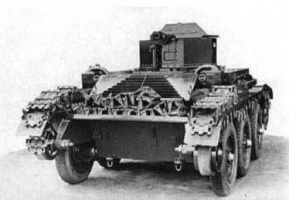 Against well-armored tanks such as the T18, it can only penetrate the rear armor. Against a fully-upgraded D1 or H35, it is virtually useless, and can only penetrate the top armor. This combination of long reload time, thin armor, and short reach means that positioning is key when playing the T7. A good player will make the most of the T7's excellent speed to get the tank into a flanking position where it can safely unload its clip and then quickly duck back into cover for a reload. When executed properly, an attack on an unsuspecting enemy tank will often leave it dead before its driver can react in time. The T7's superb gun depression also gives it more positioning options, enabling it to safely peek over steep hills and cliff edges. Though good with shoot-and-scoot tactics, the T7's somewhat slow turret traverse and poor accuracy on the move mean that it is not well suited for shooting and moving at the same time. 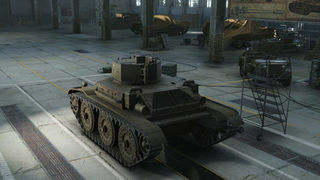 The T7 Combat Car was given to players only a few months before the Light Mk. VIC, and since both feature similar machine gun armaments, the two are often referred to together. The T7's and VIC's machine guns both have large clips with high burst damage, poor penetration, and long reload times. Comparatively, the VIC has slightly less burst damage per clip at 360 average hitpoints, but a much shorter, albeit still long, clip reload of 18 seconds. Despite the differences, they are relatively minor and both vehicles can be treated similarly. 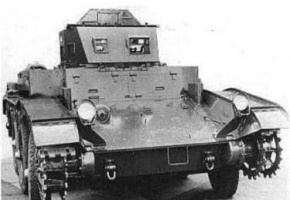 In November of 1936, it was decided that the cavalry should develop a new combat car capable of driving with or without its tracks. 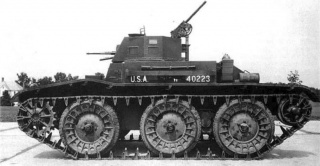 Though the Cavalry already had their hands on the M1 combat car, they wished for something that would not only ride smoother off-road, but able to travel at high speeds on roads. The child of this conference, the T7, was essentially a M1 Combat Car meeting these requirements. The main difference was the fact that the 2 pairs of bogies on each side were replaced with 3 large road wheels on each side. The last wheel of each pair were what powered the vehicle when moving without tracks while the front pair controlled steering. Each of the last 2 road wheels on either side were sprung with a leaf spring bogie while the front road wheels were sprung with a helical spring. The first pilot model was constructed in 1938 at Rock Island Arsenal and sent to Aberdeen for testing. Many complications arose from various parts of the suspension, which delayed testing until improvements could be made. 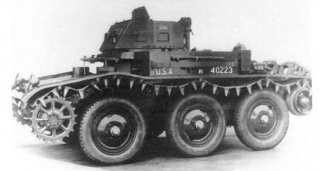 Additionally, although the tank was capable of reaching speeds of up to 35 mph off-road or 55 mph on wheels, the practical speeds were lower as the vehicle became too difficult to control when going so fast. 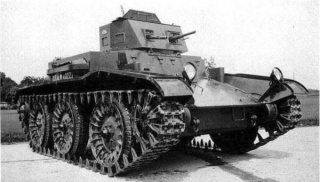 By 1939, tracks had developed to the point to where the ability to drive the tank on wheels had become superfluous. Because of this, all work on the T7 ceased.